In April and May CLACS will be featuring a series of exciting events focusing in the history, culture, and current affairs of the African Diaspora experience in the Americas. These will feature insightful discussions with distingished scholars, performances by renowned artists, and experts on the topics of the Haitian Revolution, 19th Century Afro Brazilian history, the resonance of today’s Quilombos, and the figure of Cuban slave revolt leader and artist Jose Antonio Aponte. 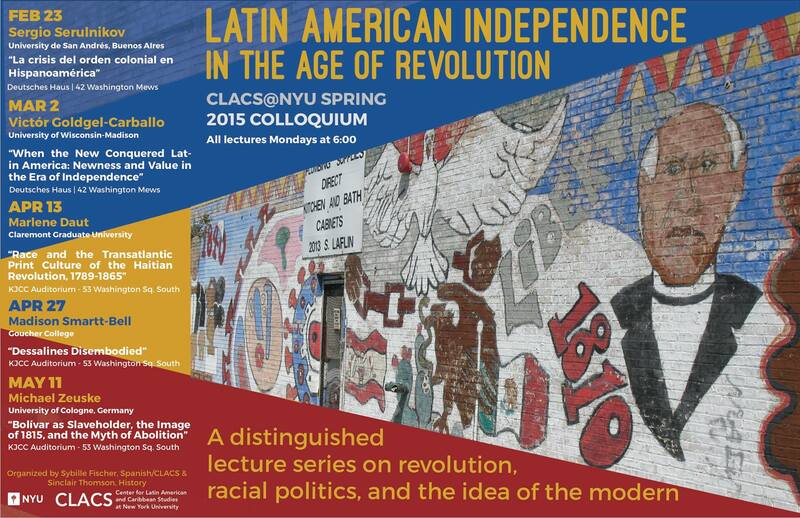 Thursday April 30th, CLACS hosts two events on Afro Brazilian history and current affairs. Starting at 5pm, distinguished historian João José Reis (Universidade Federal da Bahia), will discuss the history of slave-owning slaves in Brazil in a presentation titled “Where Slaves were Slave Owners, the Case of 19th Century Bahia.” This lecture is co sponsored by the Africa~Diaspora Forum at NYU and Fordham University. Later at 7pm, on the second event of the night, Maga Bo, both a DJ and producer residing in Brazil, and BNegão, a vocalist and composer recognized for his Afrocentric hip-hop, dub, funk, and punk music, will present “Quilombo do Futuro: The Contemporary Social and Cultural Resonance of Brazil’s Maroon Communities.” A performance which uses the notion of runaway slave communities as an onset for the interaction of traditional and contemporary music in the country. Brazilian scholar Mariela de Andrade (Universidade Estadual de Campinas), will situate their performance in the larger scope of the current challenges and success of the quilombo movement in Brazil. This event is co sponsored by The Consulate General of Brazil, The Brazilian Studies Center and ILAS at Columbia University. 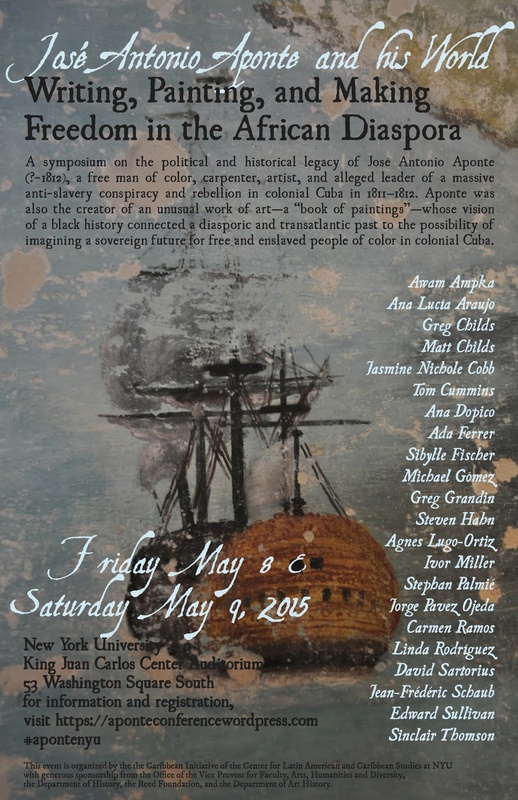 Friday May 8th and Saturday May 9th, a one-of-a-kind two-day conference hosted by NYU, centered on the leader of the 1811-1812 massive slave rebellion in Cuba. “José Antonio Aponte and His World: Writing, Painting, and Making Freedom in the African Diaspora,” features renowned scholars from NYU, and other distinguished institutions in the U.S. and abroad, will discuss the visionary leader, his legendary “book of paintings,” and the future direction of “Apontian” scholarship. 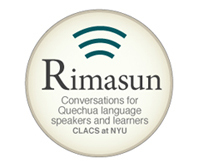 All of the above mentioned events will be held at the King Juan Carlos I of Spain Center at NYU (map) For more information on these and other upcoming events, visit the CLACS website. 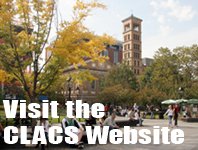 You can also find the latest information on the events on Facebook and Twitter under the hashtag #ClacsEvents. This entry was posted in CLACS News, Events and Happenings and tagged African Diaspora, Brazil, Cuba, Haiti, Latin America. Bookmark the permalink.